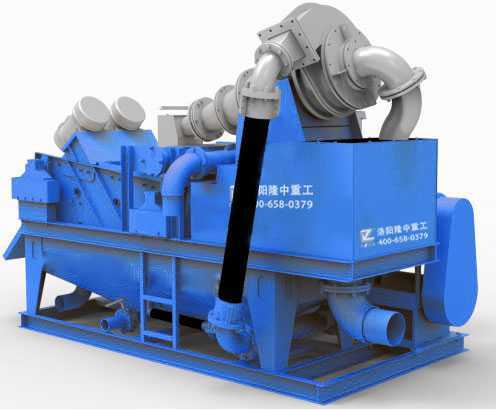 Sludge dewatering equipment is widely used in the purification and recycling of slurry for the construction of hydropower, continuous concrete wall, slurry shield tunnel, etc. the equipment is increasingly becoming a necessity of civilized construction since it not only can cut down construction cost, but also can reduce the pollution of the environment. 1.The oscillating screen has many advantages such as easy operation, low trouble rate, convenient installation and maintenance. 2.High slurry handling capacity, sand can be removed efficiently. 3.The high screening efficiency of the machine can excellently support drillers raise bore and advance in different strata. 4.Slag charge screened by advanced straight-line oscillating system is effectively dewatered. 5.Energy saving efficiency is significant since the power consumption of the oscillating motor is low. 6.The adjustable vibrating force, angle and mesh size of the oscillating screen enable the equipment possess a high screening efficiency in all kind of strata.